Book Notes: "Belgian UFO Photos" and "The Children of Roswell"
This is a new book by longtime researchers Vicente-Juan Ballester Olmos of Spain and Wim Van Utrecht of Belgium examining photos of purported UFOs from Belgium prior to 1988. One never would have thought that there existed so many UFO photos in a small country like Belgium, but here they are! Without taking sides on selection of explanations, Vicente-Juan Ballester-Olmos and Wim van Utrecht have been practicing a methodology of research that—were it far more widespread—could help determine the better theories from the more extreme ones. They are looking at, and recording, the raw data, in painstaking detail and depth, to provide current and future researchers with the rarest and most valuable resource in any mystery, authentic clues. I think that Oberg has nailed it here. The most impressive aspect of this volume is its painstaking methodology. 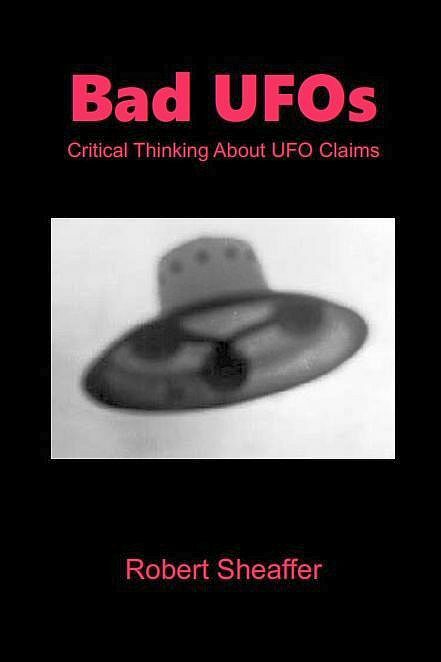 Even if you're not interested in little-known retro UFO cases in Belgium, the book is worth looking into just to see how the authors go about their investigations. Van Utrecht explained to me that 84 photographic cases were investigated in the first volume, and 92% of them could be explained as conventional objects or hoaxes. The remaining 8% "could not be properly assessed because of lack of information." We read about a streetlamp UFO, ice pillars, mosquito pillars (! ), and other unusual phenomena, as well as hoaxes. Note that the photos covered in this book, Volume 1, go only up to 1988. The famous "Belgian UFO Wave" began in 1989, and is planned to be written about in the next volume. That one will get a lot of attention, I am sure! This book came out right on the heels of one of the biggest fiascoes in the history of UFOdumb, the so-called "Roswell Slides" in 2015, where Carey and Schmitt tried to convince the world that two photos of a body in a glass case showed a dead alien from Roswell. 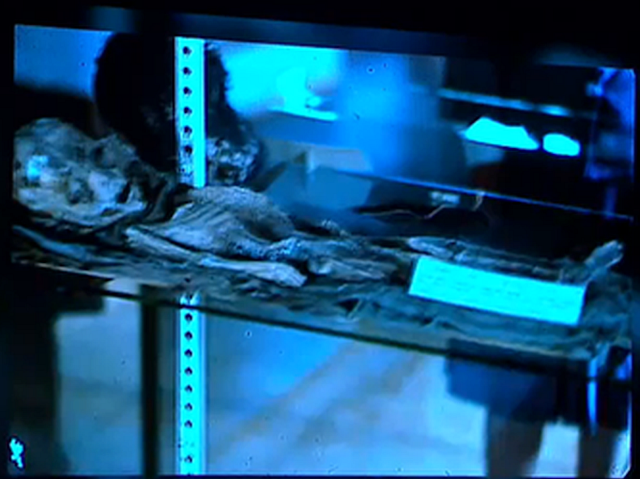 Within days of the photos being released to the world, skeptics showed that it was, in fact, the mummified body of a two-year-old Native American boy. If Carey and Schmitt had any integrity, they would have apologized profusely, covered themselves in sackcloth and ashes, and in any future UFO-related writings they would have explained what mistakes led to that fiasco taking place. Instead they mumbled something in their defense, and slinked away. Many people were curious to see what they would say in this book to perhaps justify their spectacular mistake. We now have the answer: nothing whatsoever. They say nothing in this book about their role in the recent "Roswell Slides" fiasco, and pretend it never happened. The government's great Roswell Conspiracy, according to Carey and Schmitt, is much bigger and more sinister than you ever imagined. In the original version of the story, as told by Berlitz and Moore, when rancher Mac Brazel brought some debris he found into town, nobody knew what it was, and the Army Air Base sent two officers out to gather more samples. But in this latest telling of the fable, the government conspiracy has grown to be much larger and more sinister than before. Before Brazel brought the debris into town, he gave samples to some of his neighbors. Soon everyone and his little brother in the town of Corona had crash debris samples. They were even placed on display at a Fourth of July rodeo, where they "stole the show." Souvenir hunters went out to gather up their own samples. "Neighbors hid their bounty in caves, in water tanks, under floor boards, in sacks of feed, in fruit sellers, and even inside jars of canned peaches." Wow! Somehow the government found out about this alien debris, and went into panic mode. "The White House resembled a war room, as unscheduled meetings continued to express the utmost concern for what had fallen out of the sky in New Mexico," a statement that seems to have no substantiation except in the authors' overheated imagination. The government allegedly decided to make an all-out effort to recover every last piece of it, including those that had been hidden away in private hands. Civilians were reportedly told, "If you say anything, you will be killed. And your entire family will be killed as well." TV host Ben Hansen, who should know better, writes about the book: "We now know that the American government stooped to the lowest level of humanity by going so far as to issue death threats to child witnesses." But just because somebody makes a claim of government harassment doesn't mean that it's true. Carey and Schmitt even go so far as to claim that skeptical Roswell investigators Robert Todd and Karl Pflock were part of the government coverup - "standard procedure within the U.S. government's 'damage control' phase of containment." If you like your conspiracy stories big and bold, this book is for you.